January 15, 2015 – Brown-Forman’s Collingwood Rye 21-year-old whisky was named Canadian Whisky of the Year tonight in the fifth annual Canadian Whisky Awards. Collingwood Rye was also named Connoisseur Whisky of the Year (multiple-market) as one of the five finalists for the top honor. 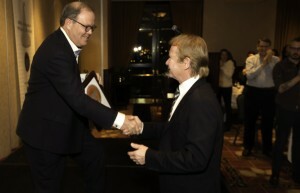 Canadian Whisky Awards founder Davin de Kergommeaux presented the awards during a ceremony at the Hotel Grand Pacific kicking off this weekend’s Victoria Whisky Festival. Brown-Forman regional sales manager Chase Stampe accepted the award for Collingwood. “It’s something that we’re really, really excited about,” he said after the ceremony. “To be rewarded in a way that celebrates Canadian Whisky, number one…and the Collingwood brand, number two, in multiple areas was something that was super exciting for us.” The whisky comes from Brown-Forman’s Canadian Mist distillery in Collingwood, Ontario, when 50 barrels of 100% rye whisky were laid down by former distillery manager Harold Ferguson in the early 1990’s. The barrels were found by current manager David Dobbin in late 2013 and bottled for release in 2014. Other finalists included Canadian Club Chairman’s Select 100% Rye, which was named Connoisseur Whisky of the Year (Canada-only), Masterson’s Rye 10-Year-Old Batch 5 Barrel A2-062 as Connoisseur Whisky of the Year (export market), and Stalk & Barrel Rye Whisky from Still Waters Distillery was named Best New Whisky of the Year. Canadian Club Chairman’s Select 100% Rye was also honored with an Award of Excellence for extending the range of the Canadian Club brand, while Crown Royal’s Single Barrel received an Award of Excellence for raising the profile of Canadian Whisky. Masterson’s from California-based The Other Guys was honored with an Award of Excellence for its Rye barrel finishing program that takes whisky distilled at Calgary’s Alberta Distillers and uses high-quality finishing barrels. The evening’s only standing ovation, though, went to Forty Creek founder John Hall, who received the CWA’s first-ever Lifetime Achievement Award for his 20-plus years at Forty Creek. Hall sold the distillery to Gruppo Campari in 2014, but remains with Forty Creek as chairman and chief whisky maker. 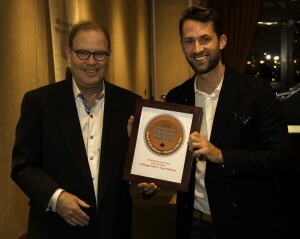 “Forty Creek has led the way for connoisseur Canadian whisky in the US, and has opened many doors for all Canadian whisky brands,” Davin de Kergommeaux said in presenting Hall with the award. 53 whiskies won medals in the competition, with 12 golds, 14 silvers, and 27 bronze medals. The blind judging was done by a group of whisky writers and bloggers, including WhiskyCast’s Mark Gillespie. Complete results will be posted at de Kergommeaux’s Canadian Whisky web site.